Its the start of the really busy time of year when it comes to growing vegetables. Sims Hill would love to have some volunteer help during the daytimes in the week to help out. 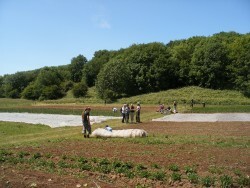 You would get some great experience and knowledge about growing veg on field scale, be part of a fantastic growing team (who have alot of fun as well as work hard) and get some outside action and great exercise, and a good feeling in your heart for giving up some of your time, and the huge appreciation from sims hill!